Big Flat Bread is a new evolving pizza house and offers an extra ordinary label that would change your view about pizza parlor. 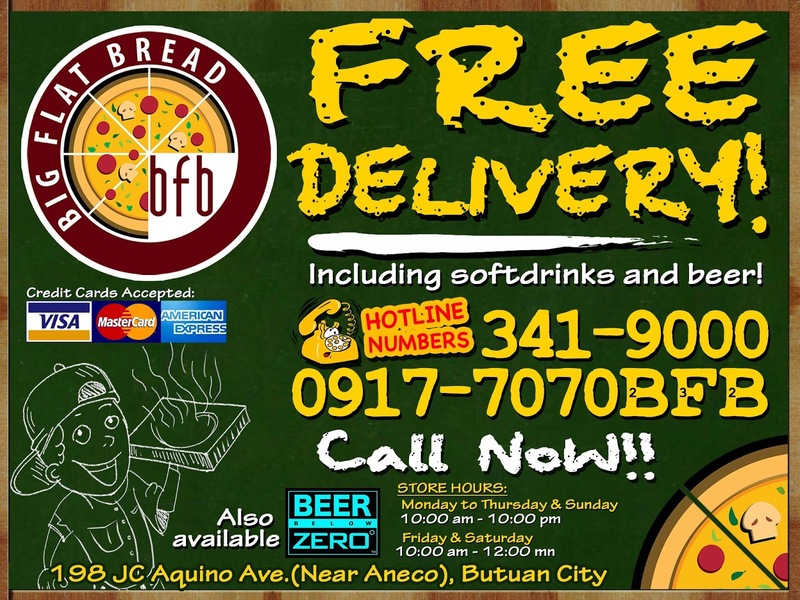 Along J.C.Aquino Street in Butuan City, I bumped with Big Flat Bread with the invitation of a friend. 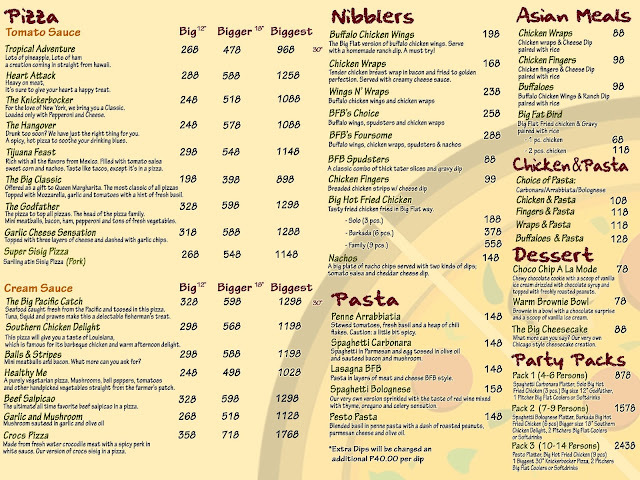 Curious with what they can offer I browsed into their menu and was surprised with the food selections I can choose from. 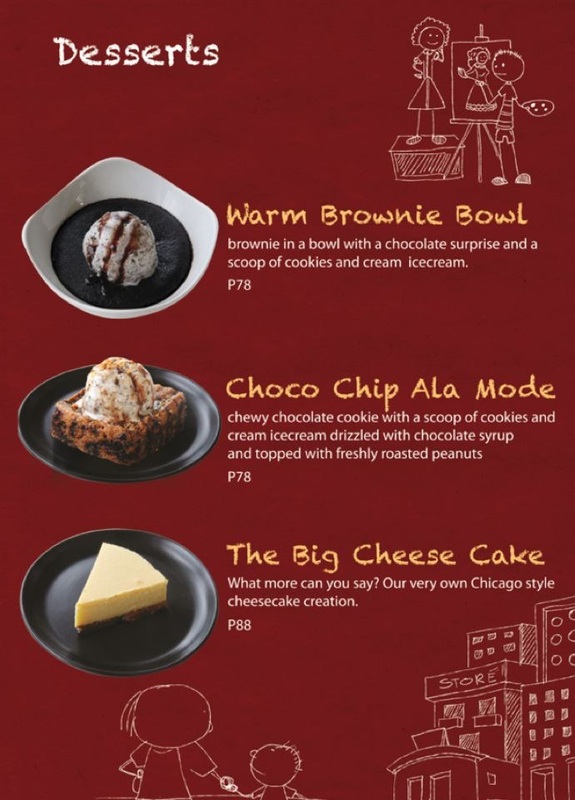 My eyes feasted on the different mouth watering dishes ranging from flat breads, buffalo chicken wings, pasta, desserts, beverages and so forth and so on. I was also amused the way their pizzas were labeled .They have the top rated very spicy HANGOVER PIZZA which according to their staff is best paired with a very very chilling below zero cold beer; the best selling Godfather Pizza ; the Balls and Stripes and the ever famous Knickerbockers just to name a few. Judging the resto's interior, I found the beige chairs and tables accentuated with red bricked walls as appetite engaging to my eyes, making me feel hungry down to the end of my gut. The place made me believe like I was dining in one of the “sosyal” resto in the metro and has reminded me of the classy atmosphere of Bonifacio Global City's High Street. The store is also Wi-Fi ready for you to connect with your favorite social media while waiting for your order to be served. In every place and establishment I pop in, I frequently look for the "top selling" and the "unusual" the "house" offers. First is the "UNUSUAL". Reading from their menu, I locked my eyes into something I have not tried before, so I ordered the intriguing CROCS PIZZA! Hola !… I have tried and have eaten a lot of exotic foods before but never a crocodile meat as toppings on a pizza bread. As an environmental advocate by degree and nature, it made me hesitate to munch on this special type of pizza . But as I asked the source of their meat , the manager explicitly explained that the meat came from the cultured bred from Palawan which is allowed by law. 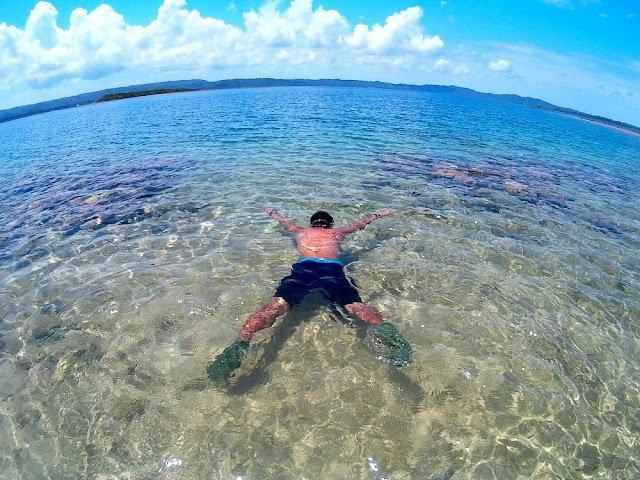 Crocodiles are being cultured for their thick expensive leather skin to create bags , belts and wallets.To maximize this resource, other restos in Palawan including BFB make use of innovation, converting the meat for a dish instead of taking it into waste. That sounds fair enough! The pizza was served with lots of spices and it was somehow almost similar to eating a very spicy Sisig only the meat was so tender yet crunchy with a very distinctive taste at the end. It was generally sumptuous, exotic and left me wanting for MORE. Second is the best seller HOT HOT HOT BUFFALO WINGS. The dish did not fail my very sensitive buds as the spicy chicken really kicked my appetite to the top. This was was best paired with a shot of BELOW ZERO BEER to tone down the hot and sizzling spices . 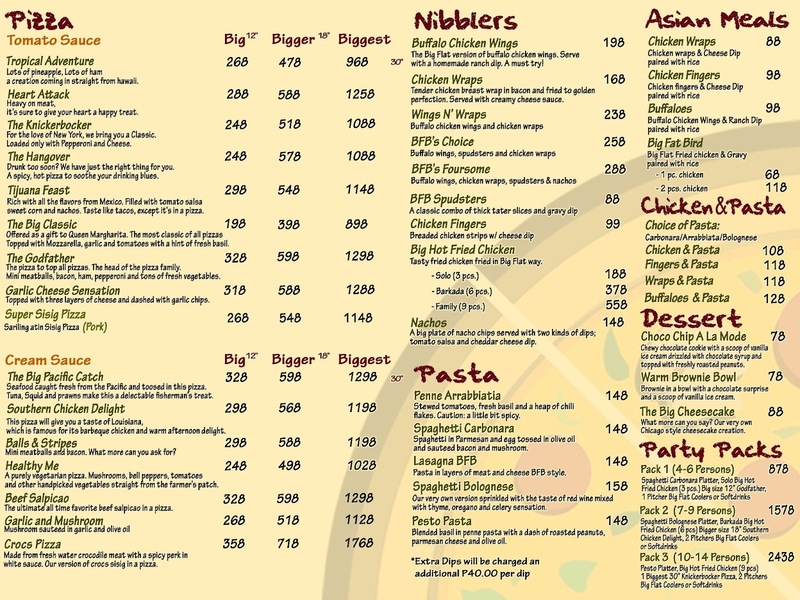 Generally the resto lived up to its name as the serving starts with BIG, BIGGER and BIGGEST sizes at a very affordable prices . For a regular single customer who wishes to satisfy an instant hunger, the store offers some sort of a value meal for as low as Php 88.00. According to their manager/owner, the difference of the store among others is the way they bake the dough of their pizza.It is being cooked under the hood utilizing the original ways of baking which is aided with red hot bricks that has been a traditional practice in Europe ever since. The bricks somehow added up to the authenticity of the flavor and the aroma of their sumptuous thin crusted pizza. 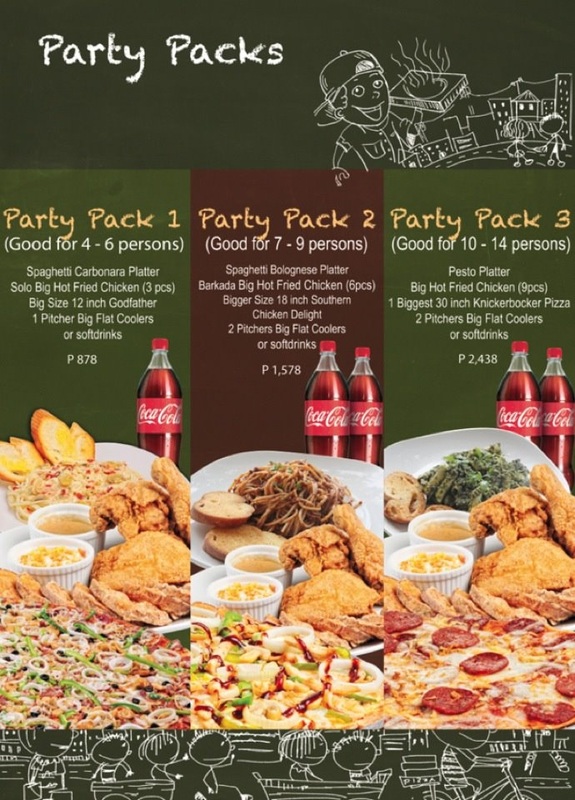 This is also the only pizza house in Mindanao that literally rock you with its gimmicks and events that are surely a smash with your barkada . It is now becoming a regular tambayan or favorite hangout among the nocturnal groups for some chatting while enjoying some rockin' or serenading music in the resto. 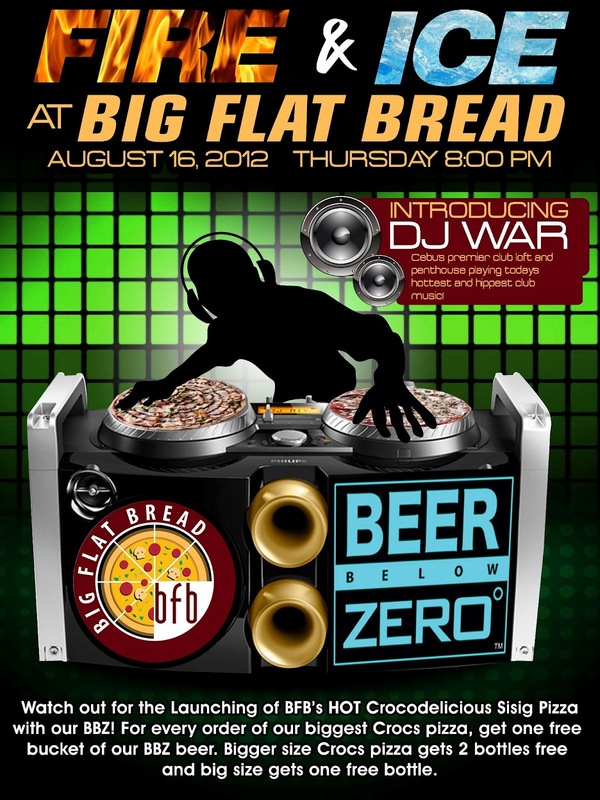 Last August 16, the management even imported a DJ from Cebu for the amusement of its patrons.Check their FB page BFB Big FlatBreads to see more of the BFB prices , promos , events and updates. 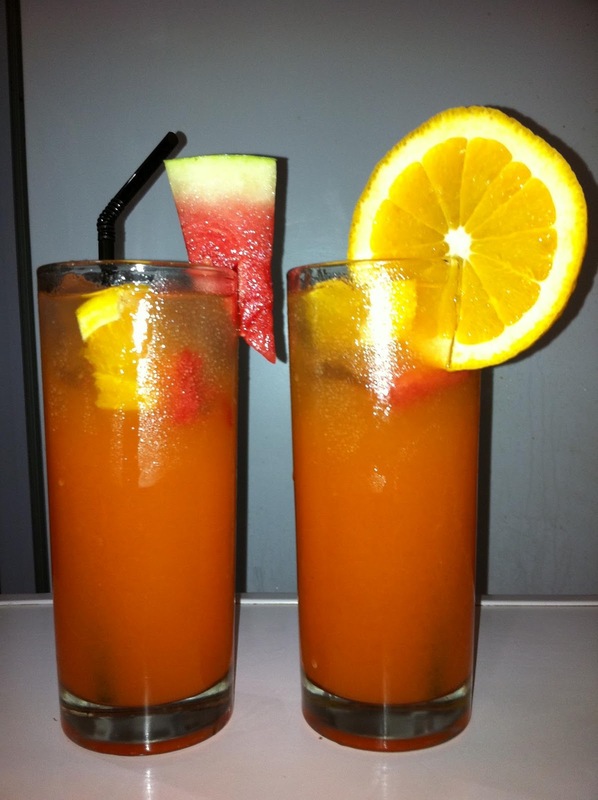 They do free delivery as well within the city and accept major credit cards. 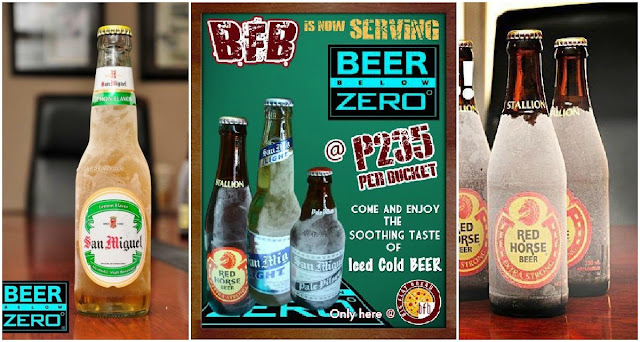 I would love to try this in Butuan. Nice post. Nung last time na andun ako, wala pa ata to eh. I would definitely want an order of the croc pizza. Croc pizza? Now that's something I really got to try. I'll definitely try to get some when I have the chance to visit Butuan. You mentioned it can be really spicy? Is it possible to ask them to adjust the heat? 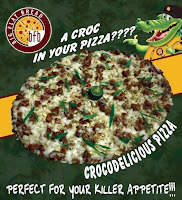 Nakakain na ako ng croco Sisig, croco egg omelet sa Crocodile Park d2 sa Davao..hmmmm must try itong croco pizza sa Butuan. Wow, Croc Pizza! Never tried to eat exotic food myself except for balut. 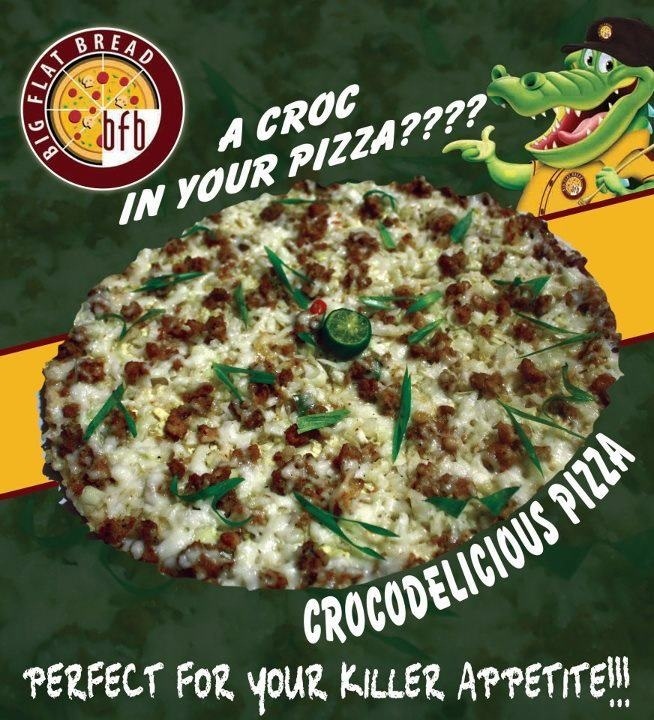 the croc pizza is so exotic, but by the look of it with all those cheese I think I will definitely enjoy this pizza, hope we get this kind of pizza here in Manila! 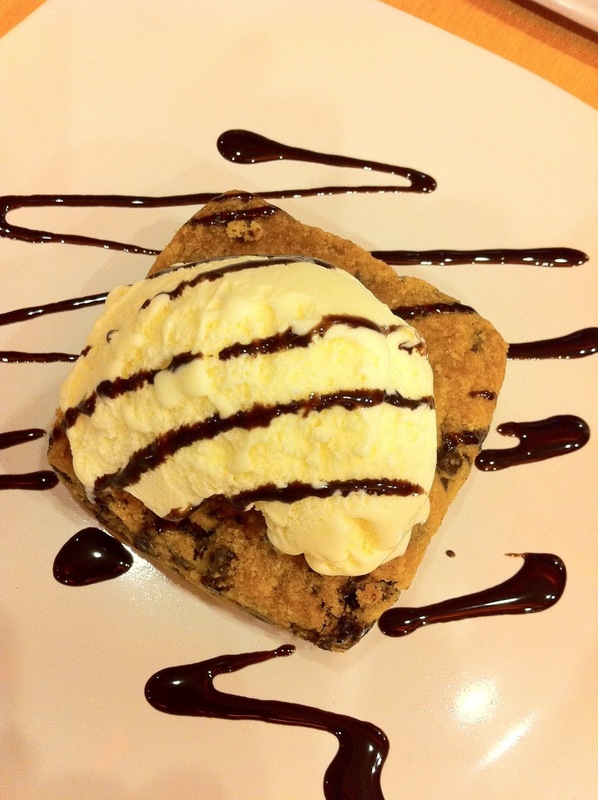 Ang sarap tingnan! I would have to make up for all the calories if I go pig out in this joint! I've never heard of Crocs Pizza until now. Do they also taste like chicken? You know what? 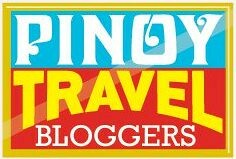 I have never explored Butuan city that much kahit 3x na ako pumunta. 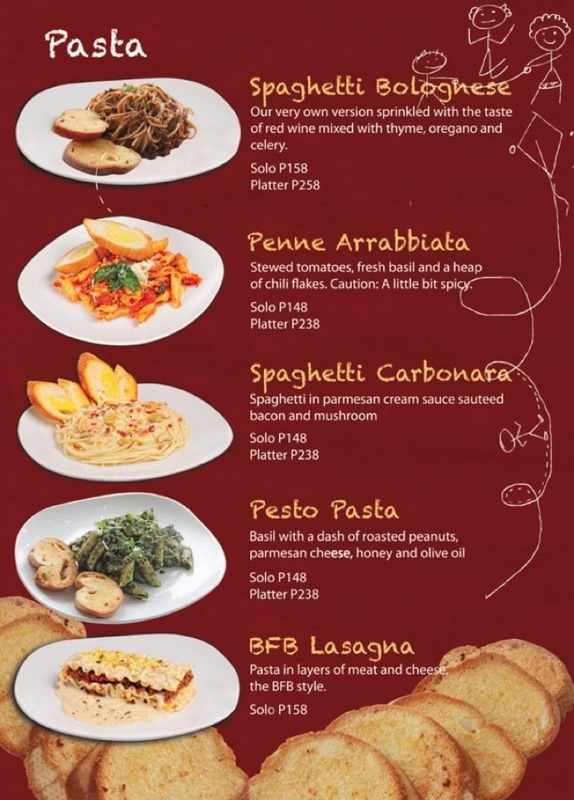 kasi naman our partners would treat us for dinner, so need na mag-laag pa...hehehe. Next time, I will do a walking tour ng downtown...at hahuntingin ko ang croc na ito!